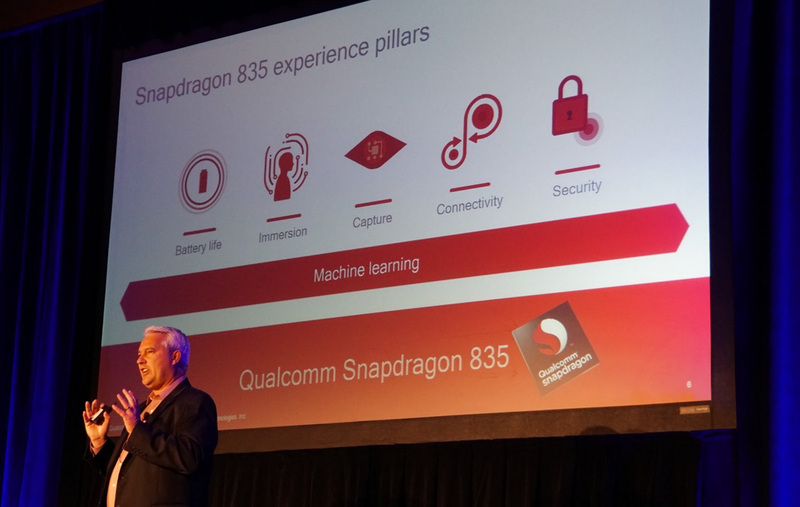 Here at CES, Qualcomm just got done fully unwrapping their next flagship processor, the Snapdragon 835. To say they are excited about the year ahead, partly because of the 835, is an understatement. Qualcomm has big plans for this next-gen chip that moves beyond just the next wave of flagship phones, though it will be in most of those. 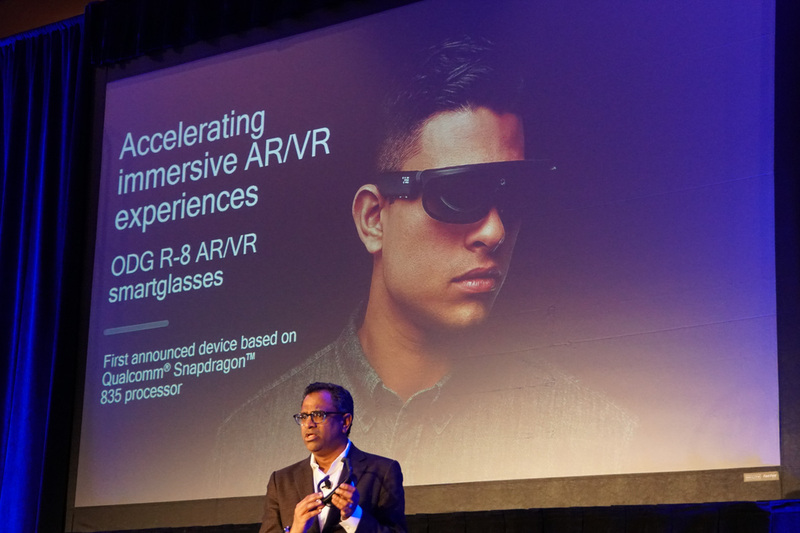 But to take this chipset beyond, Qualcomm is looking at augmented reality, virtual reality, and more. 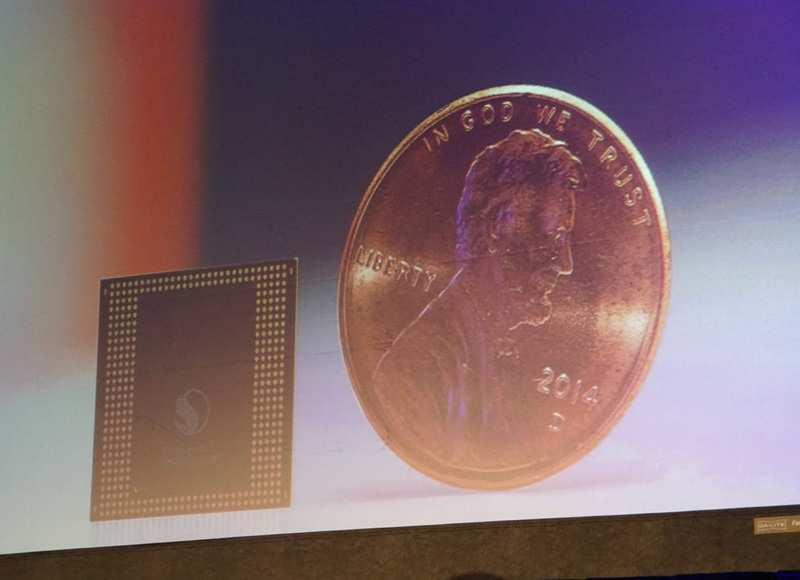 As you know, the Snapdragon 835 is Qualcomm’s first 10nm processor. What you may not have known is the fact that this processor is “35 percent smaller in package size and consumes 25 percent less power” then the Snapdragon 820/821. It also runs the Kryo 280 CPU, is equipped with Quick Charge 4.0, new Adreno 540 GPU, X16 Gigabit-Class LTE modem (Cat 13 LTE), 802.11ad WiFi, Qualcomm Haven security platform, is 4K-display ready, and can power 32MP cameras or dual 16MP shooters. 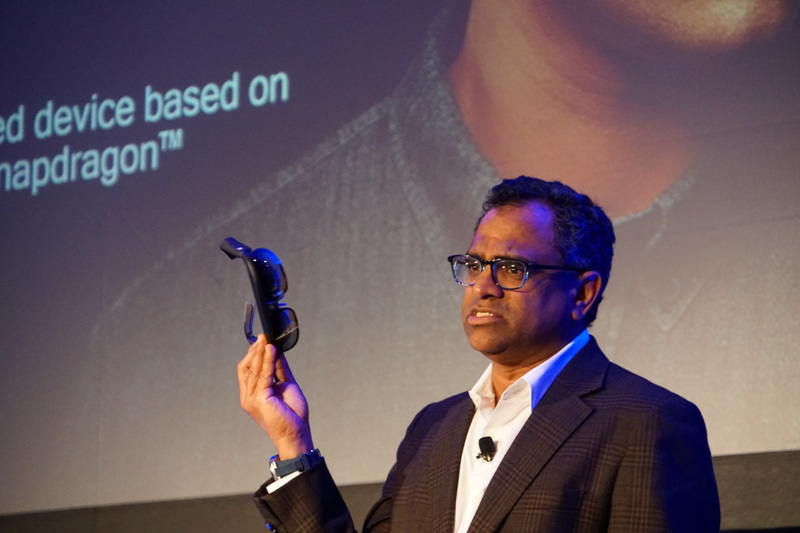 Outside of those goodies and how they will work in flagship phones, Qualcomm is also planning to use the 835 in VR and AR experiences. That could mean phones, like through Daydream phones or Tango, but it means newer products, like VR glasses. The Snapdragon 835 is in production now and will start shipping in devices over the first half of 2017. The full press release can be found below, but processor nerds are going to want to head over to Qualcomm’s site to get the dirty details. You’ll get those here. 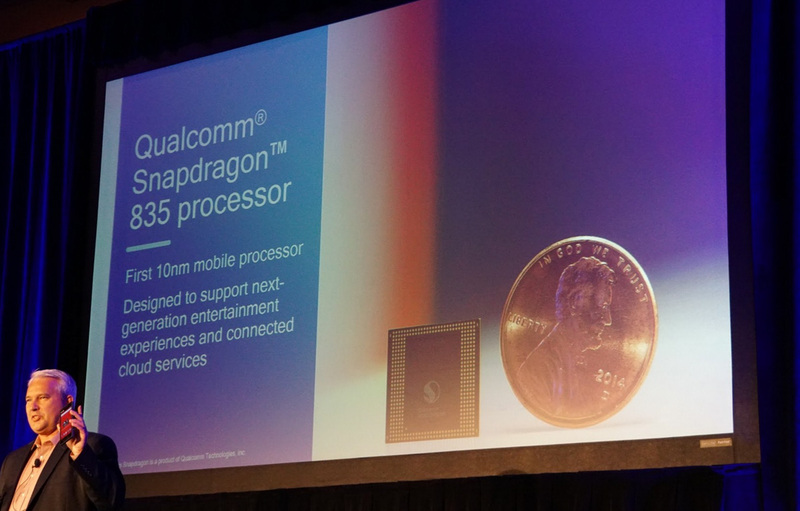 LAS VEGAS, Jan. 3, 2017 /PRNewswire/ — At CES® 2017 today, Qualcomm Incorporated (NASDAQ: QCOM) announced that its subsidiary, Qualcomm Technologies, Inc., has introduced the Company’s newest premium-tier mobile platform, the Qualcomm® Snapdragon™ 835 processor with X16 LTE. 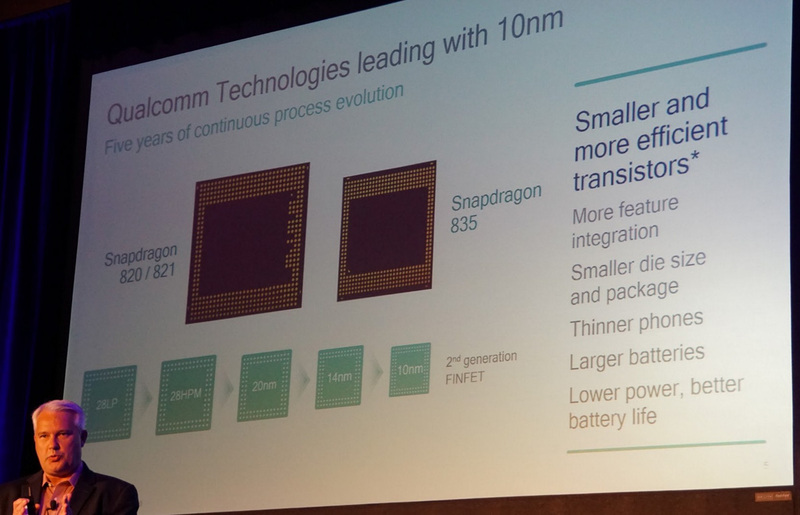 The Snapdragon 835 processor is the first mobile platform to be commercially manufactured using the 10nm FinFET process node, allowing for breakthrough performance and superior power efficiency. The Snapdragon 835 is designed to support next-generation entertainment experiences and connected cloud services for premium-tier consumer and enterprise devices, including smartphones, VR/AR head-mounted displays, IP cameras, tablets, mobile PCs and other devices running a variety of OS’s including Android and Windows 10 with support for legacy Win32 apps. Key components of the Snapdragon 835 processor include an integrated X16 LTE modem for Gigabit Class LTE connectivity, integrated 2×2 802.11ac Wave 2 Wi-Fi and Bluetooth® 5, and optional 802.11ad for Multi-gigabit connectivity. 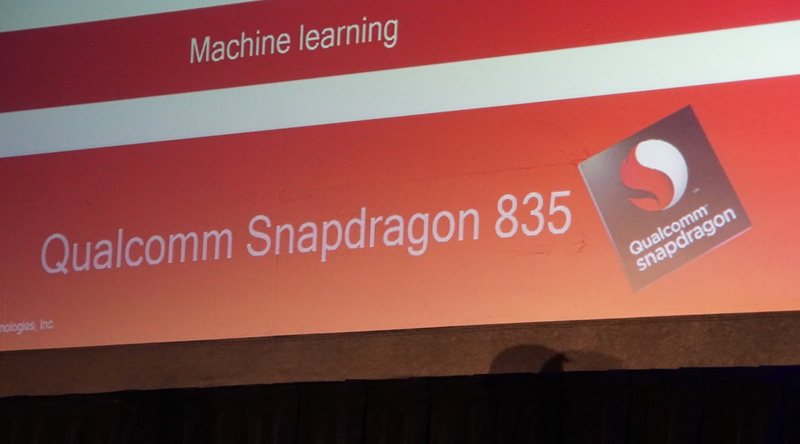 Improved processing power and performance is supported with our new Qualcomm® Kryo™ 280 CPU and Qualcomm® Hexagon™ 682 DSP, which includes support for TensorFlow for machine learning and Halide for image processing. The Snapdragon 835 also includes substantial enhancements to the Qualcomm® Adreno™ visual processing subsystem, including the new Adreno 540 GPU and Qualcomm Spectra™ 180 image sensor processor (ISP) for next-generation camera capabilities. Also new in Snapdragon 835 is the Qualcomm Haven™ security platform with enhanced security for biometrics and device attestation. Pillars bolstered by machine learning: Upgrades to the Snapdragon Neural Processing Engine software framework include support for Google’s TensorFlow and enhancements to Hexagon DSP with Hexagon Vector eXtentions (HVX), including custom neural network-layer support, and power and performance optimizations on Snapdragon heterogeneous cores. OEMs and software developers using machine learning can now enable rich experiences such as intelligent photography, strong security and privacy protection, smart automobiles and personal assistants, and responsive and true-to-life VR and AR. manufactured on 10nm FinFET technology. The Snapdragon 835 is in production now and is expected to ship in commercial devices in the first half of 2017. Please stop by Qualcomm Technologies’ CES booth #10948 in the Central Hall of the Las Vegas Convention Center to see live demos or visit our website for more information: www.qualcomm.com/products/snapdragon.